As we surveyed the scene the other day, the farmers pointed out that I should remove the older leaves of the plants. 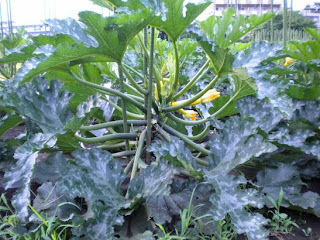 In the wet, hot, and humid weather that is the rainy season in Tokyo, the mass of leaves created a still, warm, and dark place where aphids (or the diseases they can carry) could thrive. Trimming away old or ill-looking leaves opens the center of the plant up to light and air, which also strengthens the impact of the extra-light-inducing aluminum foil. The extra space makes it easier to apply Neem oil again, harvest, and beneficial insects can cruise in easily at will. At home in Michigan, I confess to not managing my plants at all. I simply let them sprawl and run at will like the rest of my plants, which created a jungle-like effect that I dearly loved; however, a favorite spouse of mine would grumble a bit when helping with the watering. (To be fair, it did make walking in the garden a bit troublesome.) Here, where growing space is at a premium and garden hygiene a paramount concern, judicious pruning of plants is a requirement. It's important to note, though, that this practice requires some balance. 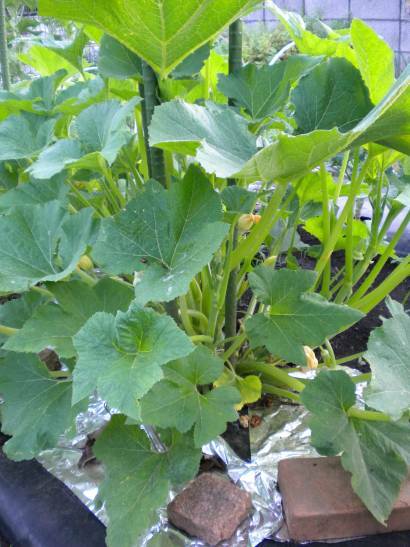 Enough leaves need to remain in place to allow photosynthesis to continue unabated while removing enough to keep air circulating and sunshine penetrating. The farmers advised aiming for old leaves and extraneous branches (similar to the "sucker" branches on tomatoes), which also allows the plant to focus its energy on making fruit. 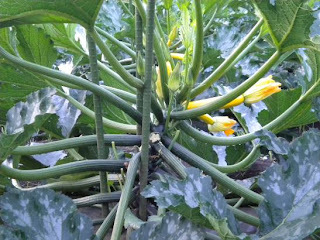 The first two photos show the farmers most beautiful zucchini plants trimmed and producing like mad. The airy structure allows easy access for beneficials, wind, sunshine, and the daily harvest. My zucchini, shown in the third photo, clearly need a bit of a tidy in comparison. The plants look healthy enough, but space could be made to help protect against future troubles. And to make finding those yummy patty pans that much more convenient!